I really liked this book, I thought it was really good if you like art and crafts. Some of the things are a bit tricky to make, I didn't like the Mechanical Arm because I thought it was quite boring. I really like the Snow Globe and I was inspired to try to make it. The pictures and instructions are in steps and they are really clear and easy to follow, however you probably won't have most of the equipment lying around your house so get ready for a trip to the shops! I especially enjoyed this book because I am interested in art and I like Star Wars. Some of the items are more difficult to make than others and this is indicated on each page with a little symbol. I think the author has tried to include something for everyone. Do you like arts and crafts? If so you will love this book and you can change the theme if you want, for example: some of the planets in Star Wars are snow covered so you can swap to Christmas themed, so don't worry if you are not a Star Wars fan. 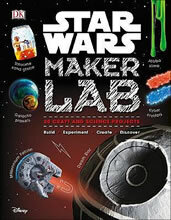 Star Wars maker lab is a fascinating crafty book filled with robot arms ,icy snow globes and much much more! I didnâ?™t get round to making these but I adored the cyber crystals. I was lucky to get the book back in the end because my cousins are obsessed with Star Wars! I found this book very interesting but half of the things in this book that you need to make is not comething you would always have in your house so I think if you want to do some of these crafts then be prepared to go shopping! I would highly recommend this book to Star Wars fans and crafty people! Why donâ?™t you give it a shot? This book is AWESOME it has some great activitys to do and lots of discoverys to find. My favourite experiment was the jabber slime because it looked fun. Unfortunately I did not get chance to try and make the slime because I didnâ?™t have any contact lense solution. Most of the ingredients in a lot of the activitys people do not normally have at home. I recommend this book to people that like inventing and making objects because this is what this book is about. Would you like this book? I hope you enjoy this book as much as I did. I really enjoyed this book because I find art interesting to look at , do you like art? My favourite picture is the lightsabre because it was brightly coloured and I enjoy how to make it but sadly I didn't have the ingredients to make it. I didn't like the Anakin's mechno because it looked really boring. The author made my feel gob smacked of how people he made all of those art pieces. This book is full of amazing illustrations and instructions but you probably won't have all the equipment in your house. It's still really interesting and I would recommend it to people who like art. Star Wars Maker Lab is a really good book. It was so good, I wanted to make absolutely everything in it! My favourite thing I made was crysrals, they looked sooo pretty. Most things you can make from every day items, but some will be just as easy to go to the shop and buy. Would you like to make something in it? I really recomend this book and please read it and tell me what you think! I gave this book a 5 because 1 it was not good but I did find a few pages that where interesting but I found that in the book neighbours was spelt a different way but I really did not enjoy it but I do recommend this book if you like star wars. The Star Wars makers lab is a very good book and has extremely interesting recipes for children. If you want to be a scientist when you get older then you will like this book. I would recommend this book to anyone who likes Star Wars. Although the book is quite complicated, The Star Wars Science Makers Lab is a great book. It has a lot of resapies in it. If you want to be a scientist when you grow up this is the book for you. I would recommend this book to people of the age of 10.